Exciting and trusted digital technologies like big data, mobile, and traditional web technologies, are getting a lot of press these days. But how many companies are implementing digital technologies, and to what extent? Does implementation vary by sector? Are these companies realizing financial benefits from their investment in digital technologies? Should your firm accelerate its digital investment? A recent McKinsey survey answers many of these questions. The survey results show that companies utilizing digital technologies, “digital reinventors,” are experiencing superior revenue and earnings growth versus their “digital laggard” counterparts. 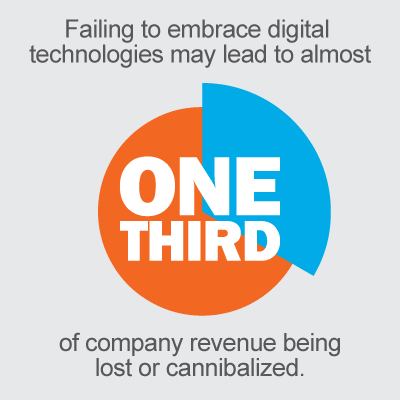 And looking forward, the surveyed companies realize that not embracing digital technologies may lead to almost one-third of their revenue being lost or cannibalized. This threat to companies comes not only from “digital natives,” but also from traditional companies that are aggressively adopting digital technologies. Not surprisingly, the survey also shows that digital technologies are being aggressively adopted in industry sectors known for technology leadership, like high-tech, media, and entertainment. These sectors are also dedicating a much higher percentage of their workforce to digital initiatives. A strong correlation exists between dollars spent on digital technologies and revenue generated by these technologies. Technology alone will not create growth, but it does enable new ways to conduct business. Companies applying digital technologies are likely to be the same companies aggressively implementing other leading-edge management, marketing, or technology innovations. As the McKinsey article notes, “companies in this group are not only investing more in digital but also investing and executing differently.” These other initiatives may also be driving an elevated operational tempo and/or new opportunities. Digital technologies are not solely responsible for revenue and earnings growth disparity. How they are used by each company is the key to success. Still, although varying in intensity by industry, digital disruption is real, inexorable, and accelerating. The McKinsey survey should be a wake-up call to any company who has not yet adopted digital technologies. Continuing to lag may lead to financial peril for such companies. What if My Firm Isn’t A Digital Reinventor? Make decisive digital investment decisions, fully funding promising investments and defunding others. Provide you with an assessment about how your company is currently managing its supply chain management and enterprise project portfolio management operations and help you identify areas for digitization that will offer the greatest opportunity for positive ROI. Help you identify which specific digital technologies are likely to be most beneficial to each of your business lines. Offer detailed guidance and recommendations on specific investment decisions for each of these digitization initiatives. Take charge of your digitization future. Complete the form on the right or call Gaea at 844 987 4232 today! This entry was posted in Blog and tagged digital technologies, enterprise project portfolio management, Oracle Primavera EPPM, Supply Chain. Bookmark the permalink.